Download "SETTLEMENT AGREEMENT BETWEEN THE UNITED STATES OF AMERICA AND GWINNETT COLLEGE UNDER THE AMERICANS WITH DISABILITIES ACT"
4 ACTIONS TO BE TAKEN BY GWINNETT COLLEGE 12. 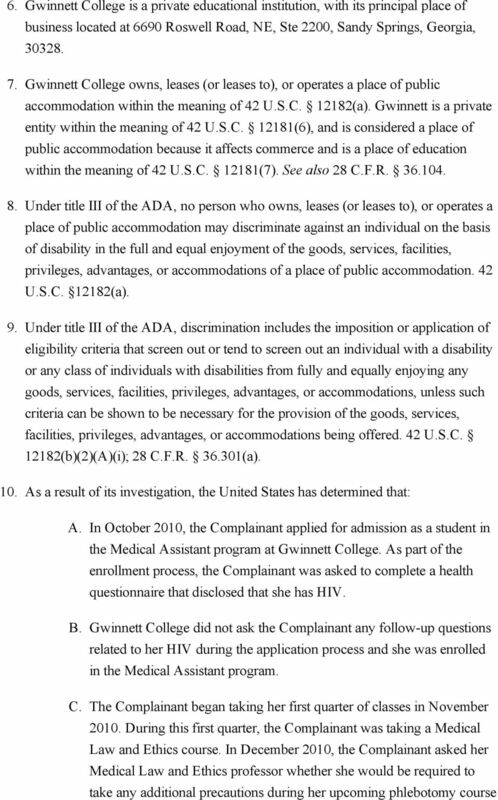 Gwinnett College shall not deny persons with disabilities, including persons with HIV, the full and equal enjoyment of its goods, services, facilities, privileges, advantages, or accommodations, on the basis of their disability, in violation of 42 U.S.C , and the relevant implementing regulation, 28 C.F.R. Part As of the effective date of this Agreement, Gwinnett College shall remove question 9 which states Are you free of all blood borne pathogens such as HIV/AIDS? from its Health Questionnaire. 14. Within seven calendar days of the effective date of this Agreement, Gwinnett College shall draft a non discrimination policy ( Policy ) that states that (1) Gwinnett College does not discriminate against applicants or students on the basis of disability, including HIV; (2) applicants and students with disabilities have an equal opportunity to participate in or benefit from the goods, services, facilities, privileges, advantages, and accommodations provided by the College; and (3) Gwinnett College shall make reasonable modifications to its policies, practices and procedures when the modifications are necessary to afford goods, services, facilities, privileges, advantages, or accommodations to individuals with disabilities, unless making the modifications would fundamentally alter the nature of the goods, services, facilities, privileges, advantages, or accommodations. Once drafted, Gwinnett College shall provide a copy of the Policy to counsel for the United States for review and approval. Within 30 calendar days of the United States approval, such Policy, with any edits provided by the United States, will be implemented and prominently posted on the Gwinnett College s official website (where it will remain for the term of this Agreement), and will be distributed to all persons who are affiliated with the College. 15. 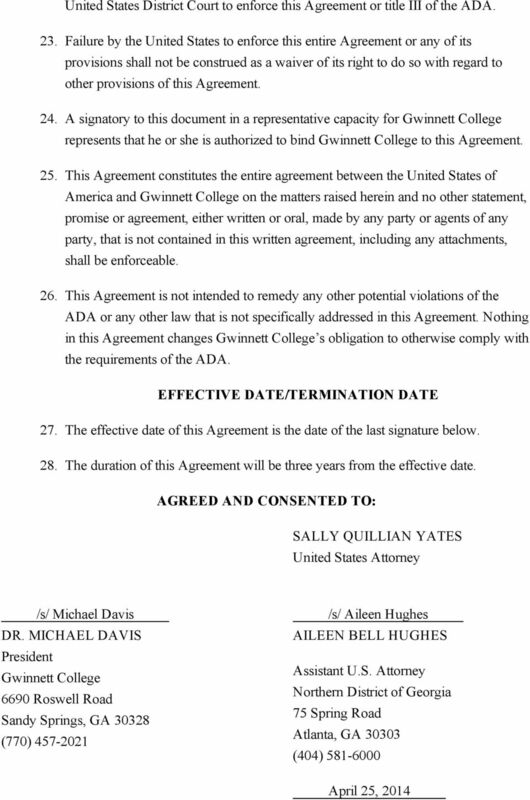 Within 120 days of the effective date of this Agreement, and annually thereafter, Gwinnett College shall provide training on title III of the ADA, with a focus on HIV related discrimination, to staff affiliated with the School (whether employees, independent contractors, volunteers, or otherwise). 16. The content of the training required in the immediately preceding paragraph, together with the text of all training manuals or written materials used in the training required in the immediately preceding paragraph, shall be consistent with the provisions of this Agreement and approved in advance by counsel for the United States. UNITED STATES DEPARTMENT.110 USLN G AND URBAN DEVELOPMENT TITLE VIII CONCILIATION AGREEMENT. Between. Complainants. And. S nutrust Mortgage, Inc. Equal Employment Opportunity Commission, Plaintiff, v. Windmill Inns of America, d/b/a Windmill Inn of Ashland, Defendant. stated in plaintiffs' Second Amended Complaint, and further, denies liability. UNITED STATES DEPARTMENT OF HOUSING AND URBAN DEVELOPMENT CONCILIATION AGREEMENT between R.H. (Complainant) and Senator Reno Holdings, LLC, Jennifer Sablan, Keith Sablan And The Siegel Group Nevada, Inc.
APPLICABLE TO PERSONAL COMPUTER ELECTRONIC HOME BANKING EFFECTIVE JANUARY 1, 2002. DC TEACHERS FEDERAL CREDIT UNION ELECTRONIC SERVICES DISCLOSURE AND AGREEMENT APPLICABLE TO PERSONAL COMPUTER ELECTRONIC HOME BANKING EFFECTIVE JANUARY 1, 2002. ELECTRONIC SIGNATURE BY CLICKING "SIGN ON"
A. Arizona School Risk Retention Trust ("Trust"). SETTLEMENT AGREEMENT RECITALS. This Settlement Agreement is made and entered into between the U.S.